This wasn't too bad! Short and sweet. I love horror/suspense point-and-click games like this! There needs to be more! The atmosphere was pretty well done once the game started, and the puzzles were well thought out. I don't think I quite finished ALL of your puzzles, but the twisty ending definitely got me. Thanks for making this! 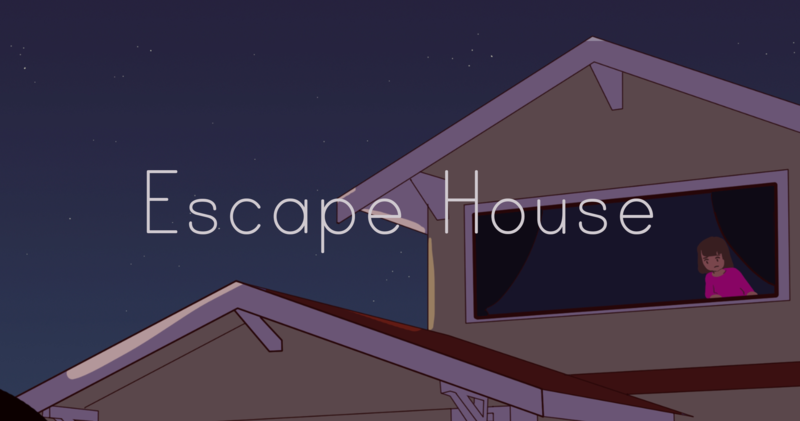 Escape House is an awesome escape room game with tension elements. You never know when the intruder is going to startle you and, try to kill you! One of the nit picks I have is at the start. She is frozen in fear but, nothing really indicates this much besides when you try to click on objects it kind of shakes. I think it's too subtle in my opinion. A very nice looking and enjoyable game. It was a little short but nicely made! I was surprised by the ending, it was a nice twist. Thanks so much! :) We had fun watching your playthrough! Really awesome game can't believe it was made in only a couple days. It's a hard puzzle to figure out and, even more suspenseful when you have some intruder in your home coming to brutally murder you with a knife! Thank you so much for playing through it! :) We're glad you had fun! I found the ending to this to be very different to what I thought. I only figured out in the end that was electrical wire and not plumbing :P You should put this on Gamejolt too if I see there you have my support. 5/5. Yea you just end up shooting him. Thank you so much for playing our game and no we definitely don't mind, we really appreciate it!! !